We met in the Algarve at Vila Vita Parc – I was w/ my hubby (who’s family lives in Bournemouth). I’m assuming you recall that :). We’re relocating to the UK – moving into our new flat in Bromley next week. Anyway, just a quick note to say I love Alice in Wonderland and the Mad Hatter is def my favourite character – played brilliantly by Johnny Depp in the last hollywood version (big fan of Depp as well). 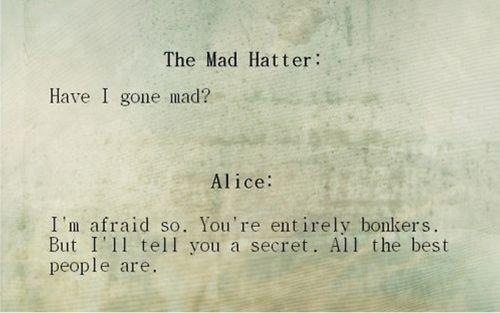 So absolutely adore and relay to this quote – thanks – made my day as I’m a bit of a mad hatter myself :). Sometimes I see your updates (as all my contacts) via linkedin and pleased to see your career is moving forward! Well done! Best of luck w/ your career & life in general! Take care & ta for now! O course I remember! Lovely to hear from you. Bromley! How funny, that is currently when I am staying. It is also where I was born…although I don’t remember much about that time. What brings you to Bromley?? Yeah, it is a fantastic quote. I am an Alice and Wonderland addict too!